Captures Bachman & Turner a little older, a little greyer, but as good as ever. I've had a long wait for this one, but it's finally here! Randy Bachman and Fred Turner reunited in 2010 with a brand new album, simply entitled 'Bachman & Turner' and proved that the chemistry that existed between them, creating some of the best examples of driving rock to ever come out of Canada, had not diminished during their time apart. I've always felt that while Bachman and Turner's work on album was great, live it was even better and when I saw them play live once Fred had been lured out of retirement, two things were clear. One, Fred’s retirement was rather premature as his bass playing and voice are still as hard hitting as ever, and two, they really, really had to record this setlist! Previous live releases from Bachman Turner Overdrive, great as they were, usually only spanned about eight songs of so. Here, we have an entire show, featuring 20 blistering tracks. Visually, the stage set of the Roseland Ballroom is excellent, consisting of steel girders like the ones depicted on the 'Bachman & Turner' cover, lit in blue. Audio wise - all the elements such as Fred Turner's powerful growl, Randy's lighter vocals, a huge bass sound: they all sound superb. As for the set list - it's hard to find a flaw. You've got classic after classic, with songs like 'Let It Ride', 'Hold Back The Water', 'Blue Collar', 'Looking Out For Number 1', 'Rock Is My Life', 'Sledgehammer', 'You Ain't Seen Nothing Yet'… and they just keep coming! There's four of the new songs included, such as the rollicking 'Rolling Along', the cool 'Waiting Game', the hugely catchy 'Slave To The Rhythm' and the jazzy 'That's What It Is' - all these new tracks fit perfectly with the established classics. The band also include a couple of live favourites from Randy's previous band, The Guess Who, with a superb version of 'American Woman' and the classic 'Shaking All Over'. Joining them on piano for that track is David Letterman band leader Paul Schaffer, who sticks around to play on the awesome final pairing of 'Roll On Down The Highway' and 'Taking Care Of Business'. There are no extras on the DVD, but the guys have always been about no frills rock, and this set list doesn't need any padding with photo galleries of interviews. The music does the talking. 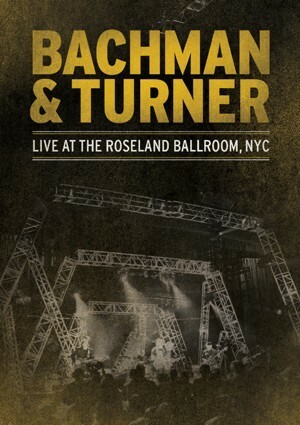 Available as Blu-Ray, DVD or double CD, 'Live At The Roseland Ballroom' captures Bachman & Turner a little older, a little greyer, but as good as ever. Essential for all fans of power chord infused classic rock!